Due to the great generosity of so many Benedict’s Beads has had a flood of orders coming in and, since this rosary business is run by one monk, Br. Benedict is snowed under. He has decided for the next few weeks, to suspend the order pages until he can catch up. We are sorry for the inconvenience that this may cause. If you have an order that is pressing, please email benedictsbeads@kansasmonks.org. As Christmas approaches, the number of orders that we get has skyrocketed. Thank you so much for your interest in Benedict’s Beads and in monk-made rosaries. This rosary business is run by a single monk- Br. Benedict- and so rosaries can only be made one at a time. In addition to his normal duties as a monk, Br. Benedict also has three other jobs that has responsibility for- working with the Legion of Mary on campus, taking classes, and assistant sacristan- all of which are also getting busier and which he can not neglect. While he is doing all that he can to be sure that your orders will make it to you on time, we can’t guarantee that any orders placed after today will make it by Christmas day (though we think we can make it by the end of the Christmas season). We wish you a very fruitful Advent and a Merry Christmas! Every once in a while, the number of orders slows down, Br. Benedict catches up, and he gets the opportunity to make a rosary simply for the fun of it. 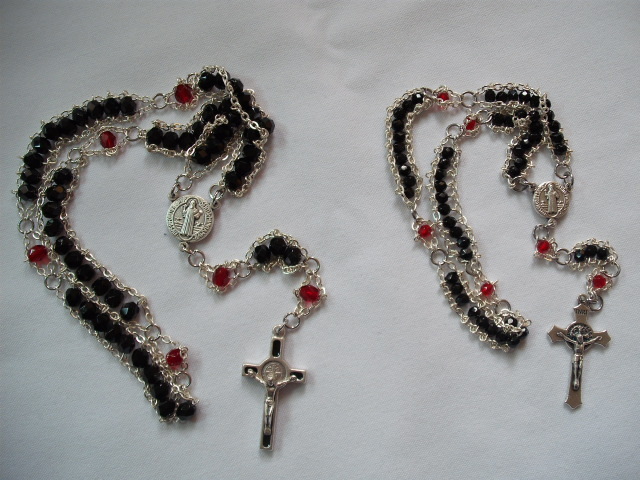 These rosaries often make it down to our Abbey gift shop, but we now have them available here on BenedictsBeads.com! We are happy to introduce Ready-to-Ship Rosaries, where you can browse the rosaries that we currently have completed and on hand. These rosaries will ship in 1 business day, which guarantees that you can have it much sooner! Enjoy our selection and keep checking back to see what Br. Benedict has been up to! Do you like super small rosaries? Ever wanted a small Ladder Rosary? We now have them available! Introducing our super tiny, elegantly beautiful, and very handy Mini-Rosaries! These rosaries are made with 4mm beads, which makes them significantly smaller than our normal 6mm rosaries that we offer throughout the store. Just check out the comparison! You may be thinking, aren’t those too small for my fingers? Surprisingly, no. Br. Benedict has been carefully testing them and has found them just as usable as a normal rosary’s beads. These rosaries can be ordered in Black, Garnet Red, Emerald Green, Cobalt Blue, White Pearl, or any combination of those that you can think of! Be sure to order yours today! We hope you enjoy, and keep praying!